Seriously, when trying to attract new patients, one of the most underutilised marketing tools is blogging! It is the number one way of showcasing your expertise. But do you ever write one? Are you even consistent in your blogging? Is it a component of your Osteobiz building strategy to attract new patients? Over in the Osteobiz Inner Circle this week, we’re working hard on getting our social media strategy sorted once and for all! And blogging is one way of educating and informing your potential patients about how you can help them. 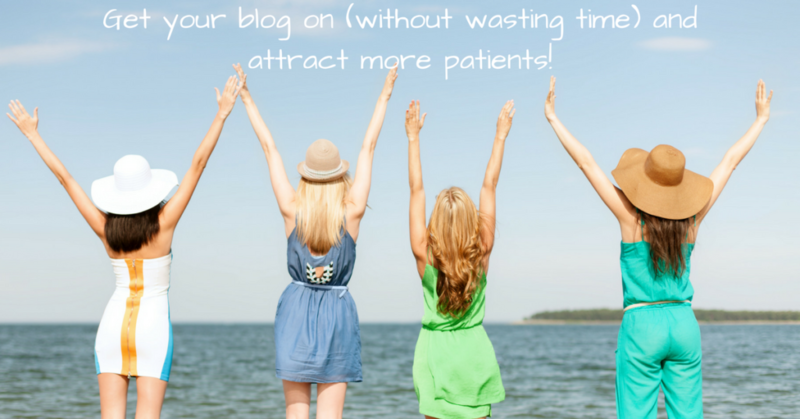 Use your informative blog to attract new patients! Your blog articles help to give you credibility, expert status and build that all important trust between you and the reader. So why don’t I see more blogs written by Osteopaths? I do wonder actually! Time and again I see other people’s blogs being shared with a ‘book to see us now’ kind of comment. But I could cry! What a missed opportunity to use that as an idea trigger and write about the same topic but with your own viewpoint and knowledge. Let’s face it, you have forgotten more than most of us even know about the body and how it functions! I constantly tell people that you have an encyclopedic knowledge of the human body. So in the same way that I share my knowledge about marketing, building your business and how to attract new patients, you can share your epic knowledge with us too! And blogs are not a one trick pony either! I write a fresh new blog every single Tuesday. That may be a bit too much for you but I’m sure you could manage once a fortnight? Or batch write some blogs. Listen in Clinic – what have they been moaning about this week? What is troubling them? What questions do you hear over and again? Do a brain download of all these things and there you have a raft of ideas to write about and awesome advice to share. Then you can also send these out, as I do, in an e-newsletter with your special advice and encouragement. You can use snippets out of the blog to make social media posts. You can add that text to a striking image. The key thing to remember is that you can post, repost and reuse your blogs over and over again. Most people WILL NOT have seen it the first time you posted it. So post it again and use a scheduling tool like Buffer to post them out while you’re busy treating – goodness that takes the hard work out of social media marketing right away! But what are the components of a good blog? Set your timer for ten minutes and begin! No medical jargon – keep it simple! A main point you want to drive home. Add #OsteopathyWorks and spread the word! I’ll be keeping my eye out for some superb blogs coming through my news feeds this week and sharing all the original blogs I spot. I’d like to see every Osteopath writing, liking and sharing each other’s blogs in order to continually educate and inform the public about how you can help them. After all, it’s FREE and ten minutes of your time well spent! This month in the Inner Circle we’re having an assault on social media marketing and getting it sorted once and for all! Come on in and join the gang! It’s only a tenner a month (one coffee per week?) and there’s no tie in of course. 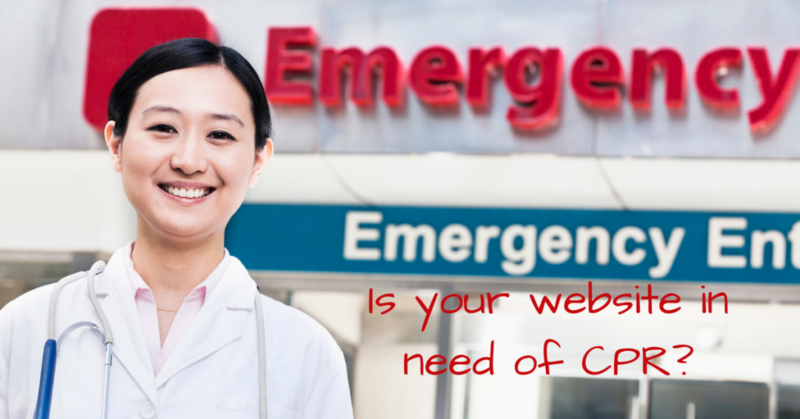 Does your website need CPR? Deep down you know that your website isn’t doing you any favours but it’s just such a pain to sort out. Your website is your shop window and presents you and your service to the world! But if it is old and clunky it will not be doing you any favours at all and indeed it will be utterly useless. And if potential patients can’t find you easily online, you are losing out big time and therefore so are they. With technology and the online world shifting so quickly into overdrive, it is crucial that every growing business also keeps pace. An ailing website is of no use to you. Some stats to blow your mind! 500 new websites are being created! 1.8 million Likes on Facebook! 204 million emails are sent! There are now over one billion websites out there! So you can imagine that the search engines need to discount all the old, non-mobile friendly or static websites from its searches just to give it a chance of providing current and relevant results. It’s all geared towards giving excellent user experience. Eighty percent of all searches are now done on mobile phones or tablets. To improve our experience, Google will not list any non-mobile friendly websites as it is annoying to have to scroll backwards and forwards sideways in an attempt to read the page. Old websites do not naturally adapt to the smaller screen. Is your website dead and buried? If your website was developed before around 2011, it is unlikely to be ‘responsive’ ie to adapt to different sized devices and still look and behave properly. People landing on an old website are unlikely to stay therefore and will probably return to their search results to find something easier to navigate. The search engines are also ignoring websites which are never updated. So if your website is just lurking out there somewhere and there is never any new content or updated pages, it will not be listed in results. That is why it is so important for you to have access to the back of your website so that you can update information and edit the text. Another crucial way of keeping your website current is to regularly blog. If you hadn’t already noticed, I write a blog every Tuesday without fail (except when I’m chilling out on a sunny beach!) so that is 50 pieces of new content every year. You don’t need to be quite so prolific but if you decide on a monthly blog, then I suggest you diarise that so as to remain consistent. Every page and every blog post on your website then needs to be search engine optimised. This means that Google’s darling little spiders can quickly crawl through your new content and list it! Therefore you need keywords and meta descriptions on each page and blog post that ensure that people get relevant results to their search enquiry. If all that sounds daunting, don’t worry! It’s actually rather easy once you understand what you’re doing and how to do it. Search on your phone for ‘Back pain in Mytown’ and see what the results are. Does your website appear in the results? Is it easy to navigate around? Are the text and images all in line, sized correctly and the text instantly readable as you scroll through it? If not, your potential patients will be unaware that you exist and it will be more difficult for them to find you and consider you as an option for their problem. And that is a very serious issue for your Osteobiz growth. Create your own Osteobiz Website! I have hooked up with my friend and Website Goddess, Naomi Gilmour of Branching Out Online. She has created an online course geared towards creating, building and launching your very own website! It may sound daunting but indeed I created one myself in a similar way a couple of years ago. It was very, very fulfilling to do it and I actually preferred it to my then Osteobiz website. In most cases you only need a fairly basic website with easy to absorb information, simple booking and decent search engine optimisation. Your social media marketing is then complementary and congruent to that. If you would like to follow along to Naomi’s online classes and create your own website, then we have something really special for you. You will get full step by step training which you can access online for as long as you wish, a private Facebook forum where you can get techie help from Naomi and Osteobiz help from me so that you produce a cracking brand new fabulous and professional website. And basically, if I can do it, you can do it! Until midnight tonight, you can get this course and all of our ongoing support for just £197, saving you a whopping £100 from the usual price! You can also pay in ten automatic installments on the same day every month if that helps your cashflow. As with everything I do, your satisfaction is absolutely guaranteed. If you have any further questions, please do get in touch. Click here to join us now and let’s get you started today! All day long I teach. I teach how to do effective marketing. I teach why certain strategies are better than others. I teach where the best places are to focus your energies. I teach ways to maximise time spent on social media. I teach tactics for getting noticed in your communities. I have online communities of Osteopaths studying on several different courses. The course materials are thorough and in our Facebook forums we share tips, try out new ideas and give feedback on strategies successfully used. The difference in success is always the same thing though. Implementation. Those who learn, implement and then rinse and repeat are the ones enjoying great success. Indeed, I constantly invest in myself and my continued learning because the world is now faster paced than ever and technology advances relentlessly. And I don’t want to get left behind! If I have invested in my further education, then I will be implementing what I have learned. And I will be doing that fast! My ambition is to help as many worldwide Osteopaths to grow their Practice as possible. Since I began investing in online marketing courses about six years ago, technology has advanced incredibly! Almost nothing I did then, I do now. The general marketing strategies are the same but the way we deliver them has changed out of all proportion. Everyone is looking for the easy way. Many don’t want to do any actual marketing but they want business growth. But one doesn’t come without the other. And that is why implementation is key. Every day, we must get the word out to those who need us. It’s not enough to be an information junkie, to enroll on course after course, read book after book but not get around to the implementation of those new ideas. Adopting new strategies and ideas and then taking action is the one single way to encourage change in our lives. 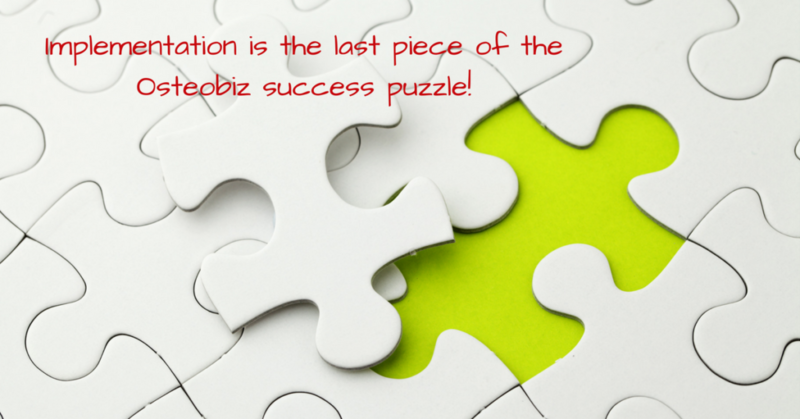 Implementation really is the last piece of the Osteobiz success puzzle! So what are you going to do today to let more people know about how you can help them? I’m excited to say that doors are open briefly for the new intake of my Osteobiz Success Formula – click here to find out if it’s for you! The fear of being TOO BUSY! When we run our own small business, we are the ones who have to constantly generate new income streams. We need to do plenty of focused and consistent marketing to help spread the word about what we do and how it may help our patients or clients. Very often, however, I find that marketing is the poor relation. It is put to the bottom of the pile of things to do. And the trouble with this is that bookings can then oscillate between boom and bust. Rather than taking the lead as a business owner, fate is allowed to be in control of our destiny by default. So when patient numbers increase we effectively take the foot off the gas and draw back. Then revenue begins to decrease and we start panic marketing again, often with no real thought behind it and with no real strategy. What we really want to achieve is a consistent flow of new patients. This then translates to consistent flow of income which is vital to our business and essential to our peace and well-being where our expenses and lifestyle are concerned. And this marketing message really needs to be punchy and highly targeted. Glib statements and lack-lustre marketing will just not catch the eye of the people who need our services. However, what I’ve noticed is that sometimes we’re a bit fearful of being so good at marketing ourselves that we might become TOO BUSY! Goodness me! Then what would we do? How will we cope? Will that mean working ever increasing days and hours until we drop to the floor with severe burnout? Indeed recently one Client mentioned that she wasn’t really busy enough but that her Principal refused to do any marketing at all because of this fear of being too busy. And I believe that this is a common misconception. But meanwhile this Associate was just not busy enough and her potential income was being seriously affected. 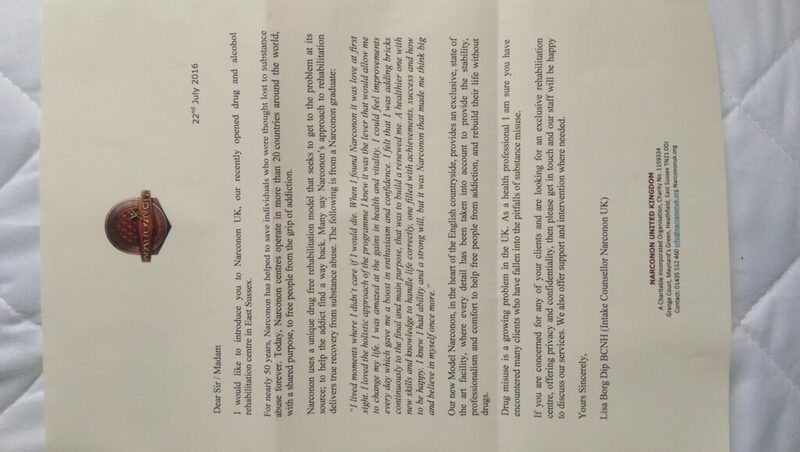 So I encouraged her to ramp up her own marketing to ensure that she wasn’t left drifting about the clinic, through no fault of her own, with few patients to treat! And this would be my advice to any Associate who isn’t busy enough. The fear of being too busy is really the fear of success! If there’s space and/or time available, take on an extra Associate to spread the load. It could be that with you being slightly less busy but your Associate getting busier, your revenue could actually increase but you are left with time to focus on development of the business itself. I have seen this many times. Look into expanding the Practice by better utilisation of the space available. Decide whether or not moving to bigger premises is the way forward so that more local people can be treated. Tighten up your marketing to be even more specific. Targeting a smaller niche will raise your profile to expert status and bring in more of the people you love to help but less of the general cases. Refer extra new patients to a local colleague. Accept that if patients want to see only you they may have to wait a little longer. Delegate more of the admin of the Practice to free up more of your time. Get a book-keeper, cleaner, receptionist, administrator and train them to meet your standards and goals. If you haven’t already, introduce an online booking system so that patients can book in to suit themselves without necessarily involving you in the process. Always maintain a basic level of marketing so that numbers do not suddenly dwindle while you’re distracted and busy treating patients. Or you could even contact me if you need bespoke strategies to create the consistent flow you want! Taking such practical steps can diffuse that fear of being too busy or too successful. It is fine to be very busy as long as you have firm boundaries on your time, energy and personal life. You might also like to take a look at my new online marketing training Osteobiz Rapid Growth which teaches easy and fun strategies to encourage new patient bookings. After all dull marketing just doesn’t work! 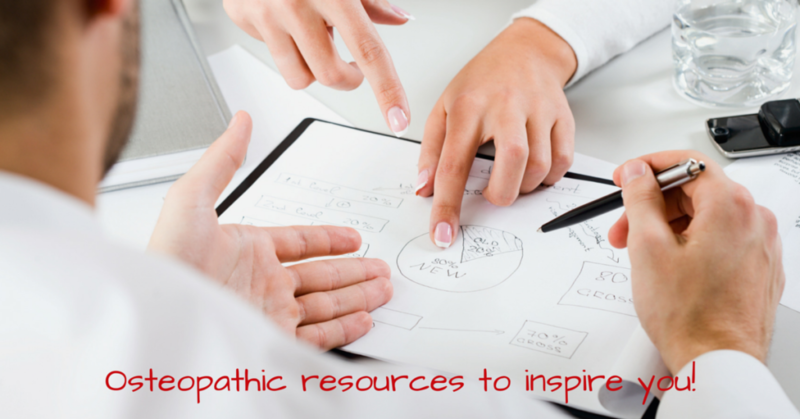 I like to keep note of osteopathic resources and today I’m sharing 5 of them with you. I’m often approached by other companies who would like to work with me in one way or another. Indeed, I’m currently having some very exciting discussions with worldwide organisations and companies and I hope to have some further news on this as things develop. THE PRACTICE DIARY – is it time to dump the pencil and paper? 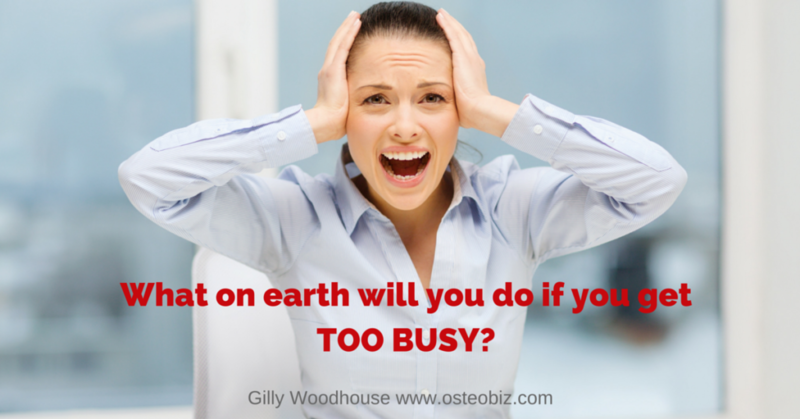 Do you know of any other fab Osteopathic resources? If so, don’t keep them to yourself! 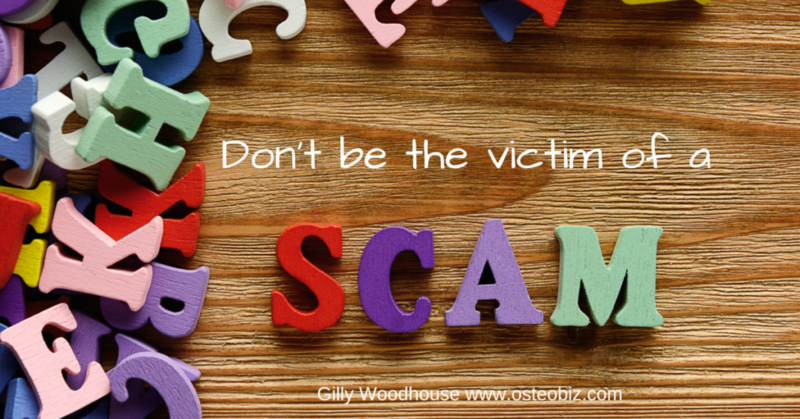 Let me know and I’ll continue to share whatever I can with a view to giving you the best Osteopathic resources to make your Osteobiz life easier.